This was the second time I stayed at this hotel the first time I hade to change rooms in the middle of the night this time the shower was broken and the water would only get warm I think this hotel needs some improvements. The location of the hotel was made it easy to travel to the places I need to go. The hotel was not as clean as it should of been. Very good, met all the needs of our trip. Need a better sign to assist in finding the hotel. Drove right past it on West park Drive. I liked the hotel room and the comfortable bed. The breakfast buffet was very good. Location and lack of signs to assist in finding this hotel. Overall, I had a very pleasant experience at this hotel. I will recommend it to my family and friends. I will definitely stay here again next time I'm in the Houston area. Convenient location, friendly staff, clean, spacious, comfortable room. There's nothing I didn't like about this hotel. The smoke free Courtyard Houston - West University is the perfect place to stay when you're visiting the Houston area. Whether you're in town for business or for pleasure, you're sure to be pleased with the service, location and amenities offered by the Courtyard. 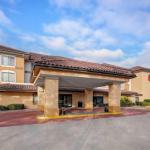 Conveniently located near the areas most popular attractions and landmarks, this hotel gives guests easy access to the attractions & landmarks like Schlitterbahn Galveston Water Park, Bayou Place, Kemah Boardwalk, Galveston Island, the George Brown Convention Center, Gulf Greyhound Park, the Houston Zoo, Minute Maid Park, the Nasa Space Center, and the Downtown Aquarium. There are also plenty of resources for outdoor recreation nearby, including court sports, a bowling alley, bicycling trails, nature hiking trails and water sports. The Courtyard Houston - West University features rooms with air conditioning, alarm clocks, coffee makers and tea service, cribs for babies, electrical adapters, and individual climate control. Guests enjoy the Luxury bedding, which includes crisp linens, thick mattresses, custom comforters and fluffy down pillows, or hypo-allergenic foam. I would definitely recommend the Courtyard Houston - West University. Online reviewers had plenty of good things to say about this location. Guests thought they received an excellent value for their dollar and were extremely happy with the level of hospitality and service given by the staff. Guests felt welcome and cared for. Guests also enjoyed the fact that they were so close to the local attractions and were glad to have so many dining options in such a close proximity. Guests also enjoyed the delicious breakfast.